Nothing powers an economy quite like a predictable and affordable source of energy. Yet nothing seems predictable these days as the U.S. and Virginia transition away from fossil fuels, the backbone of the country’s energy economy for more than 200 years. In the face of new federally mandated carbon-reduction stand­ards, there’s a growing consumer urgency along with political pressure to turn to other forms of energy to power homes and businesses. For proof, one need only look at Amazon Web Services’ decision to use more solar power. A week after cloud customers prevailed on the company to use more clean energy to power its massive data centers, Amazon announced in June that it would purchase energy from an 80-megawatt solar farm that Pennsylvania-based Community Energy Inc. will construct and operate on Virginia’s Eastern Shore. With the growing trend to put renewables in the mix, some argue that no other industry is in such a transformative and uncertain stage. Tougher antipollution regulations are forcing companies, including Richmond-based Dominion Resources Inc., to close coal-burning plants and coal-ash disposal ponds. Meanwhile, there’s a big push to tap into sources such as solar and wind power and the cheap natural gas flowing from America’s shale gas basins. Environmentalists say the push is long overdue and that large utilities like Dominion Virginia Power and Duke Energy aren’t moving fast enough. In June Virginia agreed to a $2.5 million settlement with Duke Energy, which spilled 39,000 tons of toxic coal ash in the Dan River last year after one of its coal ash ponds in North Carolina began leaking — one of many developments that seems to have given renewables new legs. Overall, federal prosecutors fined Duke $102 million for the spill. 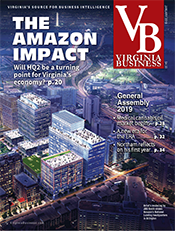 In Virginia, where the fiber-optic rich Northern Virginia region has become a magnet for massive data centers, Dominion predicts that the state will need nearly 4,000 megawatts of new capacity by 2020. The company plans to add about 3,800 megawatts of power generation with the majority — 2,954 megawatts — coming from new natural gas-fired power plants. The remainder would come from a new solar program and smaller solar applications. Appalachian Power Co., w hich serves the western part of the state, also is moving toward more renewable energy, with plans for more than a fifth of its energy to come from the sun and wind in 15 years. The assurance that energy will be affordable and predictable is critical to the state’s economy, say public officials. 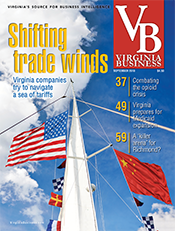 “If you’re making a $500 million investment, you want to know that certain things aren’t going to surprise you tomorrow morning, next month or next year for that matter,” says Jerry W. Giles, managing director of business expansion for the Virginia Economic Development Partnership. While many environmental groups embrace the Environmental Protection Agency’s Clean Power Plan (CPP) — with final regulations expected by the end of the summer — others fear the final plan will cause electric bills in Virginia to spike by more than 20 percent. And they aren’t convinced that clean energy and renewables alone are the best path in the high stakes emerging-energy economy. Advocates of clean energy see it differently. They want clean energy jobs that reduce pollution but not on the backs of individual property owners. 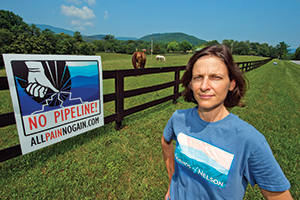 Much of the opposition, for instance, to the Atlantic Coast Pipeline — the new massive natural gas pipeline mentioned by Thompson — comes from residents who don’t want to be forced to surrender land for a proposed project they aren’t convinced is necessary. As utilities and private companies invest in new energy sources, the pressure is on to strike a balance between developmental and environmental concerns. Do the benefits outweigh the harm? That’s become a familiar mantra on nearly every proposed project — from transmission lines to pipelines — that would add to an energy grid that industry observers say already is strained by America’s growing reliance on all things digital. 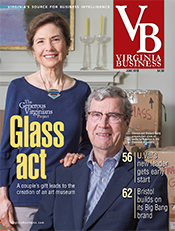 In Virginia, several initiatives are underway. Three natural gas pipelines have been proposed, with all of them cutting through some parts of the state. 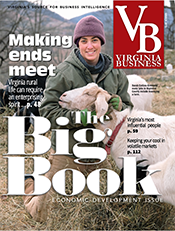 They are the Mountain Valley Pipeline, a 300-mile, $3.2 billion project; the Appalachian Connector, a 300-mile project still in the early stages of planning, and the Atlantic Coast Pipeline, a $5 billion, 550-mile natural gas pipeline that would cross Virginia, West Virginia and eastern North Carolina. 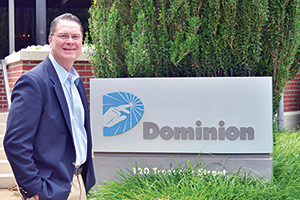 Dominion, the parent company of Dominion Virginia Power, the state’s largest utility, heads a consortium of power companies planning to build the ACP. Meanwhile, a hefty price tag may have deflated an offshore wind project off the coast of Virginia Beach, while the sun seems to be shining on solar. Richmond-based Dominion, one of the country’s largest energy producers, is gearing up to invest $700 million in the development of 400 new megawatts of solar in the state by 2020. The commitment is part of a deal Dominion cut to gain Gov. Terry McAuliffe’s support for a measure that passed during this year’s General Assembly. It freezes Dominion’s base electric rates until 2020 and eliminates rate reviews by the State Corporation Commission (SCC), the regulatory body over utilities, until 2022. Base rates represent more than half of a customer’s bill. Dominion Virginia Power and legislators who supported the change said it was needed to prevent potential rate increases as the energy industry responds to the federal CPP. The proposed regulations, issued by the EPA under the authority of the federal Clean Air Act, call for a 30 percent reduction in carbon dioxide emissions from coal- and oil-fired power plants by 2030. In Virginia, the figure is 38 percent. During the first quarter, the solar industry also was the top sector for job growth in the country’s clean energy economy with 6,600 jobs in generation and manufacturing at 19 projects across the country, including three in Virginia. However, the expected reduction of a federal investment tax credit from 30 percent to 10 percent at the end of 2016 hangs over the industry. Compared with other states, Virginia has been slow to embrace solar. Its in-state solar production lags behind neighboring Maryland and North Carolina. The Tar Heel state ranks first in the Southeast with 150 utility-scale solar facilities and about 1,000 megawatts of solar. 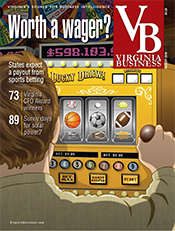 Virginia’s grand total: about 15 megawatts. Dominion filed an application with the SCC in January to construct a 20-megawatt solar generation facility near its Remington natural-gas power station in Fauquier County. Dominion operates solar plants in other states, but the Remington facility would be its first utility-scale solar facility in Virginia. It claims the plant could power 5,000 homes when operating at peak. Falling solar energy prices, combined with tougher federal coal regulations, make this a good time to diversify by adding solar, says James Eck, a Dominion vice president of business development. “Remington is a first step to get experience at doing a larger-scale solar project, but we are actively scouting properties and working with Virginia-based developers to build significantly more megawatts of solar from 2016 to 2020,” he says. While some environmental groups applaud Dominion’s solar initiative, they claim ratepayers would fare better if Dominion were to seek private development bids rather than absorb the full cost of construction. “We support the Remington project, but Dominion is guaranteed a 10 percent rate of return for the investment. We’re hoping the SCC will look at the project and say, ‘Hey, we like it, but we want you to find another way to finance it,’” says Glen Besa, president of the Virginia Chapter of the Sierra Club. Private entrepreneurs also are jumping in. 510 Nano Inc. plans to move its headquarters from Durham, N.C., to the Greensville County Industrial Park next year. It will build a 100,000-square-foot, 5-megawatt, manufacturing facility for the production of solar power systems. The $11 million project is expected to create 113 jobs in three years. The massive pipeline proposition has drawn support and opposition. Residents of Nelson and Albemarle counties have waged a vocal and well-organized “all pain and no gain” media campaign. They are among 35 conservation and environment groups in Virginia and West Virginia that oppose the pipeline and its proposed routes, which cut across mountains and national forests. 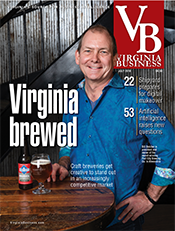 Supporting the project and the estimated 8,000 jobs it would reportedly create are more than 100 business groups and organizations, including 50 in Virginia along with the state’s chief salesman: Gov. McAuliffe. 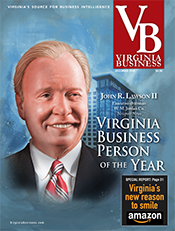 Dominion Resources is the lead partner in the joint venture, which includes North Carolina’s Duke Energy as well as Piedmont Energy and AGL Resources Inc., the parent company of Virginia Natural Gas. The ACP is expected to transport up to 1.5 million cubic feet of natural gas per day, extracted largely from huge shale deposits in West Virginia, Ohio and Pennsylvania. If the project wins approval from the Federal Energy Regulatory Commission (FERC) Dominion expects it would go into service in 2019. Dominion expects to file a formal application with FERC by the end of 2015. A decision could be handed down as soon as the summer of 2016. “One of the drivers of this project is that we’ve closed seven coal units in Virginia over the past several years, both for economic and carbon-related regulatory reasons. Yet Dominion Virginia Power still has a responsibility to keep the lights on 24/7. The way we’re going to meet that obligation is with additional power stations to generate electricity from natural gas,” says Dominion spokesman Jim Norvelle. As proposed, the ACP would originate in Harrison County, W.Va. It would enter Virginia in Highland County and drop down through Augusta and Nelson Counties, continuing to Buckingham County and extending to Greensville County before entering North Carolina and terminating in Robeson County. A spur off the ACP would extend additional supplies of natural gas to Hampton Roads. Dominion is in the prefiling phase as FERC determines whether the project meets a compelling public need. Joanna Salidis, president of Friends of Nelson, says her grass-roots group isn’t convinced that an expansion of natural gas is necessary to meet the CPP goals. “Dominion has already gone so far in switching from oil to gas, and efficiency and renewables can make up the rest,” Salidis says. Nelson residents are very upset, she adds, that Dominion originally sued some landowners over rights to survey their properties without permission, which is permissible under state law. The suits were later dropped when a judge ruled that the landowners were not notified properly. Landowners in Nelson and Augusta have filed two federal lawsuits challenging the constitutionality of Virginia’s law. Meanwhile, pipeline developers are proceeding with a second round of more than 40 lawsuits against landowners who are denying surveyors permission to come on their properties. 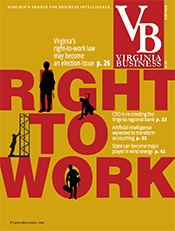 In another recent development, Dominion Transmission Inc., leader of the limited liability company formed to build the pipeline, has proposed changes to the route that would rely more on existing utility rights of way than private property in Southside Virginia, an effort the company is pursuing in other areas of the state. As originally proposed, the pipeline would use existing rights of way for only six percent of its length. In Nelson, people remain concerned about the possible use of eminent domain. If the project receives FERC approval, the developers could use the law to obtain the 125-foot right of way required for construction and the 75-foot easements that would be needed to maintain the 42-inch underground pipeline after construction. “I don’t understand why so many people, including our governor, aren’t ashamed of themselves to advocate for a project that purports to build wealth by taking it from some people to give to others,” says Salidis. Dominion counters that the ACP would benefit many people by delivering low-cost, abundant natural gas from shale fields to Dominion power stations that would be used to generate electricity for its 2.5 million retail electric customers in Virginia and North Carolina. Dominion has rerouted some of the pipeline based on citizen feedback and field tests so far. For instance, an alternative would bypass the Norwood-Wingina Rural Historic District in Nelson. Also FERC wants the company to avoid the James River Wildlife Management Area in Nelson. Shifting the route to accommodate property owners is not a simple matter. “We repeatedly tell the folks in Nelson County and elsewhere that it’s very important for us to get on the property and do this survey. 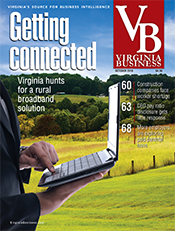 Without it, we don’t have a basis for saying there’s a reason to move the route,” says Leslie Hartz, vice president of pipeline construction for Dominion Transmission Inc. Meanwhile construction is underway on Dominion’s Brunswick County Power Station. It would generate 1,367 megawatts of power. Dominion also is seeking approval from the SCC to build a $1.3 billion, 1,585 megawatt natural-gas-fueled power plant in Greensville County that could be operational by 2019. It would generate enough new capacity to power 400,000 homes. 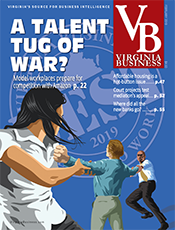 Dominion is proceeding with plans for the new plants despite a Supreme Court ruling in June that reminded the industry of the uncertainty of the times. The court remanded back to a lower court the EPA’s new Mercury and Air Toxics Standards (MATS), limiting toxic emissions from coal- and oil-fired power plants. It said EPA must consider compliance costs before deciding whether regulation is “appropriate and necessary.” Dominion noted that the decision did not vacate the rule or place a stay on its implementation, so the company is not changing plans to close coal-fired plants like the one at Yorktown Power Station. A bigger price tag than anticipated has stalled an offshore wind project Dominion was planning 24 miles off the coast of Virginia Beach. The company is looking at ways to reduce costs after bids for its construction approached $400 million, nearly double the $230 million Dominion anticipated. The 500-foot-high turbines were projected to generate around 11 to 12 megawatts. Dominion also has proposed a wind farm on an 8-mile-long ridge called East River Mountain near Bluefield. Dominion owns about 2,600 acres there and has proposed building up to 80 megawatts of wind power. However, the Tazewell County Board of Supervisors recently changed its zoning ordinance to restrict tall structures. The current restriction requires Dominion to file a variance to proceed with the project — an option it is still evaluating. Some industry watchers say the CPP may give a boost to a possible third nuclear reactor at Dominion’s North Anna Power Station in Louisa County. In its latest 15-year Integrated Resource Plan, which Dominion is required to file with the SCC, a proposal for a third unit was among four options Dominion presented as a possibility to meet demand while responding to new carbon rules. Dominion expects to receive a combined operating license (COL) for the proposed third nuclear unit from the federal Nuclear Regulatory Commission in 2016. Yet even if it surmounts regulatory hurdles, the earliest possible date North Anna 3 would enter service is September 2027. It’s projected to cost more than $7 billion and would provide an additional 1,453 megawatts of power. Dominion has not committed to building the project and says it will not make a final decision until the COL is issued. 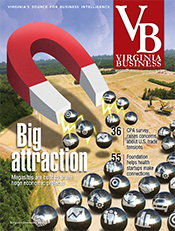 Virginia plans to reduce retail electricity consumption by 10 percent by 2020. McAuliffe moved up the goal by two years when he announced his state energy plan last fall. Since then, he has appointed an Executive Committee on Energy Efficiency to make the goal happen. The only thing that appears to be certain in today’s energy industry is that finding low-emission fuel sources to replace coal isn’t going to be as easy as flipping a switch.